Resident of Lafayette Our cherished, loving son Rob, passed away unexpectedly on October 19th at the age of 27. He is survived by his parents Frank and Janet Panacci; devoted sisters and brothers Kelli Duffy, Lisa, Tony, Gina, and Frankie Panacci; grandparents Helen King and Frank Panacci Sr.; brother-in-law Frank Duffy; nephew Brian Duffy; nieces Nicolle and Lauren Duffy; numerous loving aunts, uncles, and cousins, and many treasured friends. He also leaves behind his caring extended second family at the Moraga Orinda Fire Dept. Rob was born in San Francisco and grew up in Pacifica and Lafayette. He was a graduate of Acalanes High School, and attended the Butte Fire Academy, Class #34, the Livermore Fire Academy, and Paramedic School, where he excelled in all. In his youth, he played for the San Bruno Rams and earned a berth at the Junior Rose Bowl Championships. 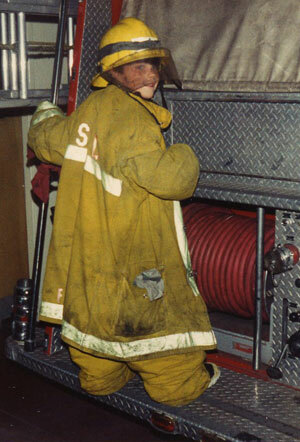 As a loyal member of the Moraga Orinda Fire Department, Rob fulfilled his life long desire to be a firefighter, serving his community proudly and with honor. Challenged by his illness, type 1 juvenile diabetes, he never let that discourage him from fulfilling this dream. Rob will lovingly be remembered for his artistic talents, his tenacity, and for his great love for his family. We find great comfort in knowing that Rob is now reunited with his much loved grandparents, Eugene King and Donna Panacci. We will all miss Rob greatly, but will carry his love and memory in our hearts and minds each and every day. Viewing begins 5PM Thursday, Oct. 23, 2008, with a Vigil Service at 7 PM at Hull’s Walnut Creek Chapel. A Funeral Mass will be said on Friday, Oct 24, 2008 at 10 AM at St. Stephen’s Catholic Church, 1101 Keaveny Ct, Walnut Creek.